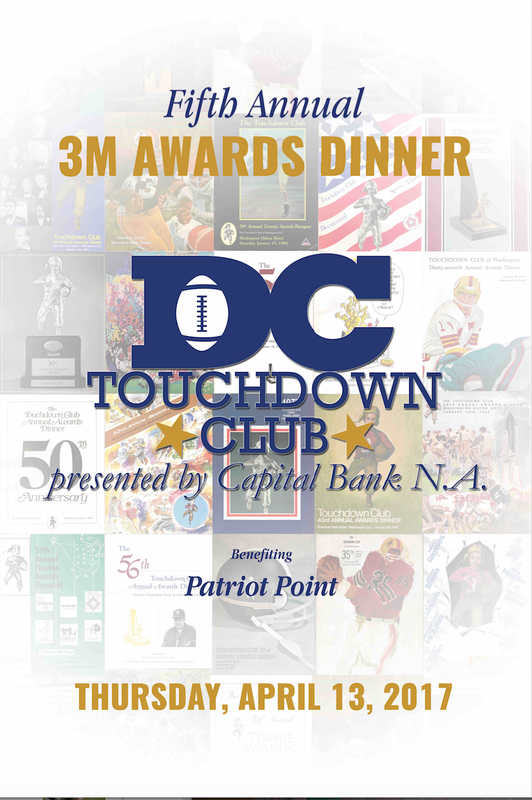 Join us April 18 for the DC Touchdown Club 3M Awards Dinner! The Washington-area football community will gather at Congressional Country Club for a night of camaraderie to honor local players and coaches. A limited number of individual seats and tables are available for purchase. Contact Steve Beck at 301-370-5454 or sbeck@militarybowl.org for additional ticket information. Sponsorship opportunities are available and can be purchased through the icons below. For additional sponsorship information, please contact Steve Beck at 301-370-5454 or sbeck@militarybowl.org. Proceeds from the dinner will benefit Patriot Point, the Military Bowl's retreat for recovering service members. Includes 10 seats. A staff member will contact you to confirm attendees. Click on the icons below to view information on past DC Touchdown Club Awards Dinners.